Rustie threw a curveball with his debut EP Sunburst for Warp, which took the decidedly unfashionable route of adding prog-rock and video-gamey stylings to his hyper-energetic production style, and as a whole it didn’t quite work out. Maybe he could have retreated from that sound and made something more conventional, sealing a more concrete future? No. 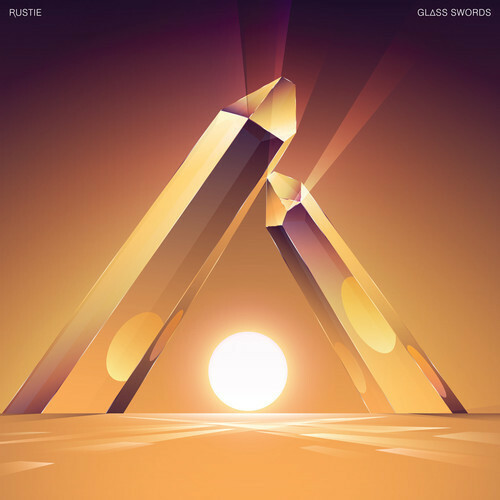 In Glass Swords, Rustie’s gone balls deep in this sound, and it’s fantastic. By following through what he started, Rustie has created one of the tightest, most thrilling and original dance releases of the year. Rustie (aka Russell Whyte) is Glaswegian, and this album is very much in line with Hudson Mohawke’s releases, as well as a good few of the Numbers lot. The LP is almost entirely composed of what sounds like the very biggest moments of other dance tracks twisted through a saccharine filter. The drops, build-ups, and all the bits in singles that make your hands shoot up into the air are crammed into nearly every second of this recording, and I would have been the first to say that I’m not sure that necessarily makes a good album. However yet again, Rustie’s here to prove me wrong, because not only can fantastic production make uncool sounds seem dazzlingly fresh, it can also sustain a 40-minute stretch of pure energy coherently and without problems. The point with this album is that it could all sound like an ADHD kid got a hold of some equipment and really went to town, making sugary and hyper-energetic dance tracks. And the first time you hear the sound, it could prove a little alien and difficult, but there’s only a very thin veneer hiding that these are almost all brilliantly skilled and exciting compositions. Intricate percussion, expertly applied vocals (often sounding chipmunked and backmasked), earth-shaking bass and even proggy guitar solos are mixed fluidly into his all-encompassing, all-smiling sound. What’s even more impressive is that on top of this, melodies and rhythms so often surprise and delight that the music makes you feel like a kid, lost in wonder at the fantastical sounds seething from every track; just look at playful and irresistible Hover Traps with its cheery synths reprised by a massive choppy bassline and scifi effects. The same infectiously energetic unpredictability is present all over the album, as can be seen when the day-glo All Night suddenly and fluently brings in a deepy wobbly bass and sliding percussion without ever breaking stride. These tracks are just bursting with exuberant detail daring to be found and enjoyed; check out the fantastic future-funk synthline that takes over the last minute of Surph or the way After Light builds into a chilled synthy number, almost entirely receding before explosively dropping with a fat bassline reminiscent of HudMo’s Thunder Bay. The variation within this distinctive sound is staggering, as Rustie glides fluidly from the propulsive techno wash of Globes past Ultra Thizz to the fantastic one-two of pacey Death Mountain and the foot-stomping bass of dubstep-inclined stunner Cry Flames. Elsewhere breakout dancefloor single Ultra Thizz builds to an explosive, disorientating drop that just screams unabashed joy, before receding into choppy glitch-hop and back again. These tracks are genreless because Rustie fuses the necessary light and dark fluently, never settling for too long and thus ensuring the listener couldn’t possibly get bored. Granted, most of the LP is sugary and energetic, but then just when it could all get happy, you get a massive meaty track like City Star, with a glittering scifi intro precluding a huge bass and siren synths that make it sound like the gangsters have showed up in Rustie’s candyland. What’s more, unlike a lot of other LPs, these energetic bursts are allowed space to breathe: we’re given strange sci-fi interludes like opener Glass Swords, or Ice Caves and Flash Back, in which gamey synths and mad sounds are somehow put together so that they work perfectly and are a pure joy to listen to. When looked at objectively, this is simply an album bursting with energetic tracks, every single one of which is an absolute pleasure to listen to. In the dance world, it’s laudable when someone does something well and when someone tries to do something new, but here both are the case, and Rustie deserves a lot of respect for that. Against all odds, this LP is brilliant, and the unlikelihood of this makes it all the more enjoyable. Here are a sugary combination of unfashionable genres that under Rustie’s disciplined hand are impossible to hate or cringe at, because he’s taken sounds that are devastatingly out-of-use and thoroughly modernized them. I’d argue that in doing so, he’s making an LP with its finger closer to the pulse of today’s dance scene than any dubstep knock-off could possibly have, because it’s focussed solely on the future, and proclaims loud and clear that anything can be made fantastic with the right person at the helm. It’s about moving towards the future of our sounds, and with a release as exciting and masterful as this, Rustie can undeniably be called the right person for the job.